Holy crow! Santa’s been here!!! Mystery present arrived today!!! I wonder what it is??? 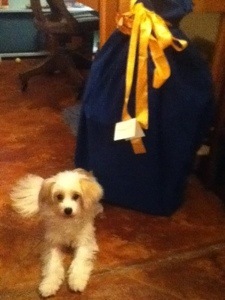 In keeping with German tradition, Sweetie & I will open our presents tonight! I don’t know how I would have gotten this home, but a kind stranger offered to give me a ride! She drove me all the way home and then all the way back to my bike. Perfect! Wait … hey…. are you going to leave us hanging like that? What is it?? 🙂 Inquiring minds want to know! Have a very Merry Christmas Kate and Kat!